When and how do I make my reservations? You should make your reservations as soon as you know your dates of travel. Prime dates sell out quickly so early booking is recommended! If you are in the United States, please call 800-580-3494 to speak to one of our Tour Coordinators. If you are located outside the United States, please call 907-373-3494 to speak with one of our Tour Coordinators. We are available Monday through Saturday 8:00 AM to 5:00 PM Alaska time. This is 4 hours earlier than East Coast time. Where do we meet our adventure guide? Meet your tour guide at the Anchorage Visitors Center Log Cabin on 4th Avenue downtown. Be sure to be there at least 15 minutes prior to departure. If you are a group of 6 or more, you may request a downtown Anchorage area hotel courtesy pick-up, at time of booking. Let the tour coordinator know which hotel and supply a contact number so your guide can confirm. How long is our travel day? Because Alaska sits near the top of the globe, the sun can shine for as many as 20 hours a day during peak season! Your travel day will usually begin at 8:00 AM and end at 8:00 PM. However, you will generally only be in the vehicle for no longer than 1.5 hours driving to each destination. Stops are provided for restrooms, meals and photo opportunities as well as the daily excursions. Evening hours with sunlight will be available for photos and leisure time. What additional costs may not be included in my tour package? Gratuities: In addition to standard tipping practices (ex: waiters and waitresses, housekeeping staff, taxi/shuttle drivers, and baggage handlers). Tipping others who provide personalized services is common in Alaska. Drivers who offer a particularly informative trip generally receive a tip from passengers at the end of the tour. Industry standard is $15 per person, per day. Fishing & rafting guides are commonly tipped by their clients. Gratuities may also be given to pilots following a particularly good flightseeing or bear-viewing trip. Tips are appreciated, never expected; use your discretion. Alcohol: Alcoholic beverages are not included on tour. Open containers are not allowed in our vehicles at any time. Upgrades: Any additional activities, tours or hotel nights are not included in the tour package price. We suggest bringing an average of $40 – $60 a day pp for food on your tour. Alaska is best known for its seafood, particularly king salmon, halibut, king crab, and shrimp, and you’ll find fine seafood on the menu in virtually any coastal Alaskan town. At the open-air, often all-you-can-eat salmon bakes in Denali National Park and Preserve, and Seward expect excellent grilled salmon and halibut. Anchorage has the greatest diversity of restaurants, including classy steak houses, noisy brewpubs, authentic Thai and Mexican eateries, and a wide variety of other ethnic places. Is there anything special I should pack for my Alaska trip? The biggest factor to consider is Alaska’s weather, of course. But activities at sea and ashore may also require some special packing. Dressing in layers is the way to go when you’re exploring the Alaskan wilderness. Pack some short-sleeved shirts (though it’s doubtful you’ll have much need for more than one pair of shorts), sweaters, and sturdy, comfortable light hiking boots or rubber-soled walking shoes. A polar fleece vest or jacket along with a wind/rain coat will round out the layering effect. We supply ear bands, gloves and umbrellas in each vehicle, however, you may want to bring them if you prefer your own. The following checklist includes some additional suggestions to help you get started – it’s by no means comprehensive, but it’s a good place to begin. There is no need to bring formal wear as our tour is casual all the way. We want to show you the “Hands-on” Alaska we have come to know and love. If you are connecting with a cruise ship, you should bring a separate bag with your formal wear that can be stored in the luggage trailer so you don’t have to carry it every day. Every guest that has brought 2 bags out on tour has stated that they “over packed”. Luggage is limited to 1 large bag and 1 carry-on bag. If you are connecting with a cruise or traveling internationally, and have two large bags, one will be secured in the luggage trailer and will not be accessible on your land tour. Are your tours accessible for all ability levels? Our vehicles are not wheelchair or handicap accessible. Our “soft adventures” require only easy to moderate levels of activity. Do you accept reservations for just 2 passengers? Yes we can if there is a group of 6 or more that has opened a guaranteed departure date! However, we suggest calling to check availability as other guests may be looking for similar dates that could be combined to make a group departure. What is Alaska’s weather in the summer season? It’s a good idea to plan for four types of weather – warm, cool, cold, and (occasionally) wet. Alaska’s vast size, varied topography, and geographical location can result in a wide range of conditions. 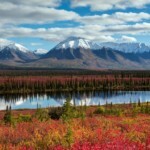 During the summer months, high temperatures in the inland town of Fairbanks near Denali National Park, can reach 90°F. Walking among the glaciers generally means cooler temps (with more breezes blowing). Further along the coast in Anchorage, the weather is normally pleasant and sunny but slightly cooler. Average temperatures across the state hover in the high-60s during peak season and the mid-50s in the spring and fall. When can I travel to Alaska? Most guests travel to Alaska from mid May to early September to take advantage of the long summer days and warmer temperatures. Vendors are in full operation during this time frame. Early May is still very brown with nighttime temperature in the 30s and snow is falling in higher elevations by September 15th. While winter tours are available, tour options are severely limited. What Identification should I have with me? U.S. Guests 18 and over are required to present a valid and unexpired government-issued photo identification (i.e., driver’s license or passport) for air travel, and it may be necessary to present this identification at other times during the trip. In addition, Guests 17 years of age or younger may be required to show additional documentation when traveling with a single parent. Non-U.S. citizens will require a valid unexpired passport for entry into the United States. Specific questions should be directed to your country’s consulate. Are Denali and Mt. McKinley the same thing? Yes. Denali the “High One” is the name Athabascan native people gave the massive peak that crowns the 600 mile long Alaska Range . Denali is also the name of an immense National Park and preserve created from the former Mt. McKinley National Park. Denali National Park opens Memorial Day and closes Labor Day. So when planning, be sure to keep this in mind. What types of animals might I see in Denali? 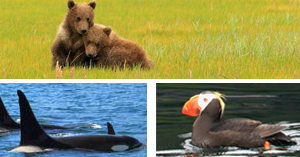 What types of animals might I see in Kenai Fjords? Can I see the Northern Lights in the Summer? You cannot usually see Northern Lights in the summer months (May, June & July) because of the daylight. In order see the Northern Lights it needs to be dark and clear out. The best time to see them is during the winter between November – March. 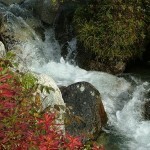 However guests on our Denali Fall Colors tour in September have seen lights in some years. Does Alaska take US Currency? Alaska is the 49th state in the US . We take US Currency, we also take personal checks for deposits and final payments on tour packages as well as two major credit cards – Visa and Master card. ATM machines are available in most places along your adventure to obtain cash in the local currency. Credit cards are widely accepted in resort restaurants and in many restaurants in major towns like Anchorage. Many small towns have only one or two eateries; some establishments may not take credit cards. What is the time difference in Alaska? What are some Alaska reference and guide books? Here are some books that are useful to those who are planning a trip to Alaska. All can be ordered through bookstores or online through the publisher or such companies as Amazon, Barnes & Noble and Borders. Harbor side shops and some meat/fish shops in larger towns provide freezing, smoking and shipping service for people who want to send their salmon or halibut home. These services may be provided by your fishing guide/boat captain. Overnight delivery is available through FedEx and other services. Travelers can also take a cooler home on their return flight home (Charges may apply, check with your airline). Ice and dry ice are available in bags between 5 and 10 pounds at grocery and convenience stores, as well as gas stations. There is a 5lbs dry ice limit when shipping fish. What about tidal safety, can I walk out on silt beaches? The tides of Cook Inlet have the second greatest tidal range in the world, with a maximum range approaching forty feet. While these tides are impressive to watch they can also be very dangerous. They boast powerful currents, some as fast as 20 miles per hour, and they come in very quickly. The tidal flats are usually composed of gray clay that acts as a binding quicksand, which coupled with incoming high tides, make a dangerous combination. Most simply, DO NOT WALK OUT ONTO TIDAL FLATS. Are the mosquitoes as bad as they say? Often jokingly referred to as Alaska’s “state bird”, 25 species of them can be found in the state. They are present from April to September, but none carry disease. In Alaska, they are most often found on coastal flats and in forested valleys. The worst occurrences are in areas of slow moving or standing water. The insects are most active at dusk and dawn, but low temperatures and high winds will decrease their activity. It is always wise to wear protective clothing, like long sleeves, and use good insect repellent. Each of our vehicles have repellent in them, as well as mosquito zappers. Most of your activities offer a slight breeze or open areas, minimizing any effects.